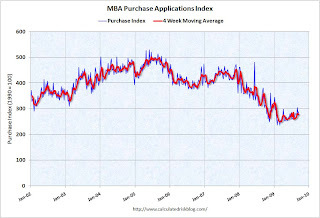 It shows that mortgage purchases peaked in 2005 and fell for about 3.3 years before turning up. This morning, the report out of London said mortgage applications were up 88% year over year in August. We entered the 15 "good years" back in February of 2009. Real estate prices are on the way up! Calculated Risk does a great job of producing charts!